As I have noted in a number of entries in this blog, government has in fact been contracting rather than expanding during this economic recovery, and that indeed the resulting fiscal drag can account for the weakness of the recovery. 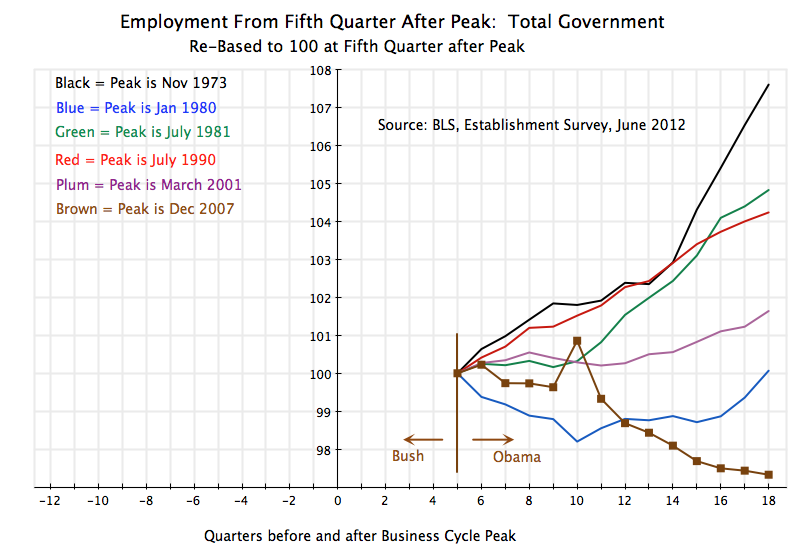 See, for example, the posts on fiscal drag during the recession (here and here); the reduction in total government employment (including state and local) during the period Obama has been in office (here and here), with federal government employment flat and non-defense federal employment falling (here); and on federal government spending that has in fact been close to flat during the Obama term, in contrast to the sharp increases under recent Republicans (here). Given the importance and centrality of this issue in the weak recovery, it is important to get the facts right. While the previous blogs have looked at the relationship of government spending in recent US economic downturns to the pace of recovery of GDP, they have not explicitly examined the assertion Romney and his Republican colleagues have now raised that higher government employment accounts for the slow recovery in jobs. This can be done quickly, through a series of graphs. The analysis here complements and extends the earlier blog post on fiscal drag as the principal cause of the weak recovery from the 2008 collapse, and the blog post on the path of employment during these downturns. Total employment was falling at a rapid rate when Obama took office (and at that point, had fallen by more than had been the case in any other US downturn of the last four decades). Actions taken by Obama at the start of his administration (as well as aggressive actions by the Fed) started right away to bend this curve, and within a year it had bottomed out. Since then there has been positive and remarkably steady employment growth, but at too slow a pace given the depth to which employment had fallen to make up for the initial decline. The path has been the weakest seen in any of the recoveries from the downturns the US has faced over the last four decades. In no other downturn has the US had such a cut-back in government employment. Yet Romney and his Republican colleagues are arguing for even greater cut-backs, including for firemen, policemen, and teachers, as Romney stated in the quotation copied above. Looking closely at the two graphs above on government employment, one might note that while the reductions in government employment were greater under Obama and in the most recent downturn than in any other, the second smallest was in the recovery following the January 1980 downturn. This period was initially under Carter (for four quarters) and then under Reagan. 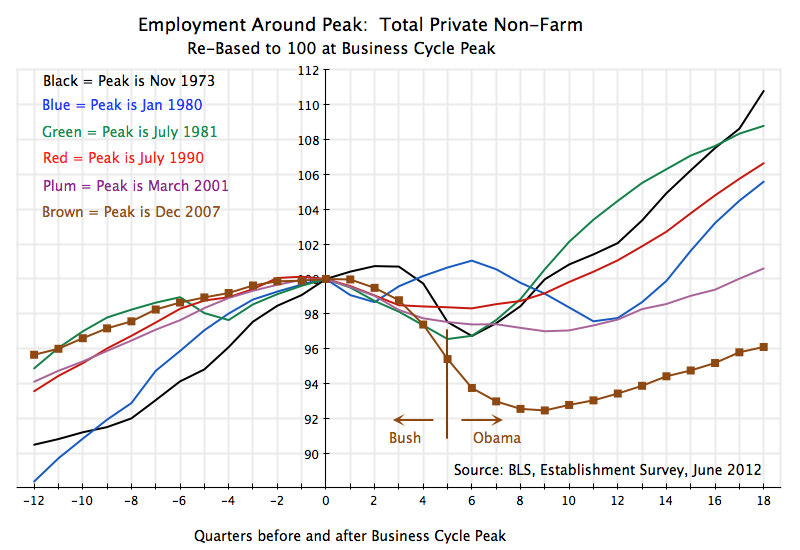 Since I have noted before in this blog that had government grown under Obama at the pace seen under Reagan, the economy would now be at close to full employment, is there a contradiction here? The answer is no. First, one should note that the “recovery” from the January 1980 downturn merges into that from the July 1981 downturn (but leading by six quarters), as the economy went into a new recession a half year after Reagan took office. 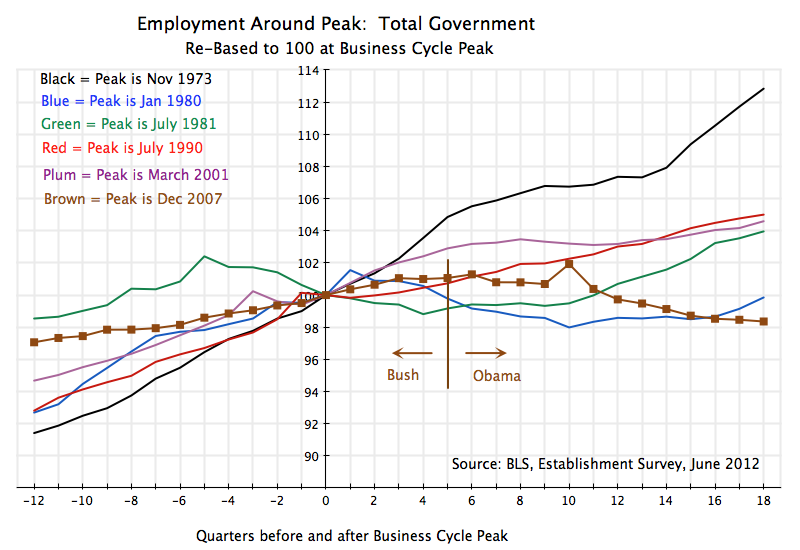 Reagan did cut back on government employment initially, before allowing it to grow. Hence the paths followed by the green (July 1981) lines in the graphs above are more directly related to Reagan’s policies than those indicated by the blue (January 1980) lines. Second and more fundamentally, the importance of the government sector to the economy and its recovery is more related to overall government expenditures than to simply the number of government employees. Romney and his Republican colleagues are simply missing this point when they focus their criticisms on the number of government workers. Reagan expanded government spending, but the focus was on things like defense expenditures rather than the number of school teachers. Defense expenditures are done under contract to private companies (much of it to a few giant companies such as Boeing and Lockheed). Building modern jet fighters and naval ships can be very labor intensive, but these are employees of private contractors, and are not directly classified as government workers. 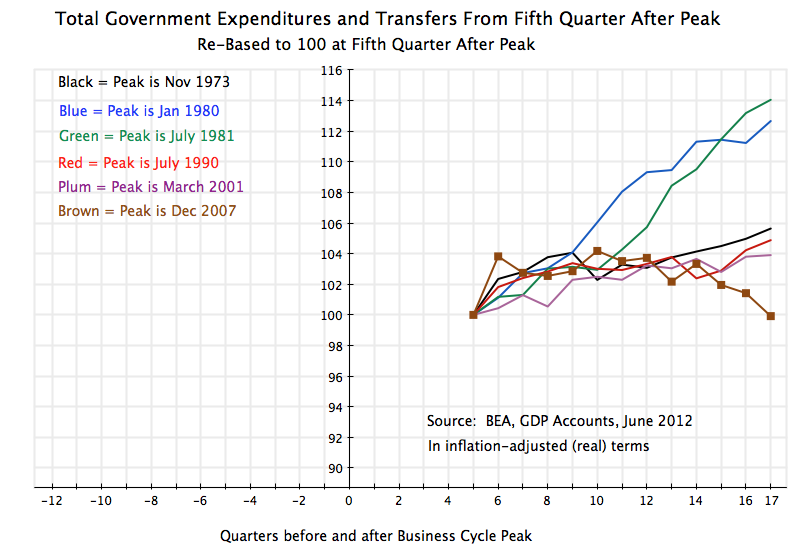 Growth in government spending during the Reagan periods (the blue and green paths) is the highest of all, especially when one starts five quarters from the cyclical peaks (when Obama took office). In summary, if there was any basis for the belief of Romney and his Republican colleagues that cut-backs in government employment and spending would lead to strong growth, then the economy would be booming right now. Government employment and spending in the current downturn, especially once Obama took office in January 2009, have been below the paths followed in each of the other downturns the US has faced over the last four decades. The recovery has been weak because there has been weak demand for the goods and services that business could produce. There is no point in hiring a worker to make something if you cannot then sell it. Government demand has been weak, as seen in the graphs above, due to strong Republican opposition. Investment demand has been weak, despite record low interest rates and high cash balances on corporate balance sheets, since there is surplus production capacity. There is little point in investing to build even more capacity when what you have is not being fully utilized. Consumer demand has been weak, both because of weak incomes (the high unemployment and depressed wages for those who are employed) and because of the collapse of the housing bubble, which wrecked household wealth. And global demand has been weak, due to crises in Europe (with its own mis-guided policies focussed on austerity) and elsewhere. 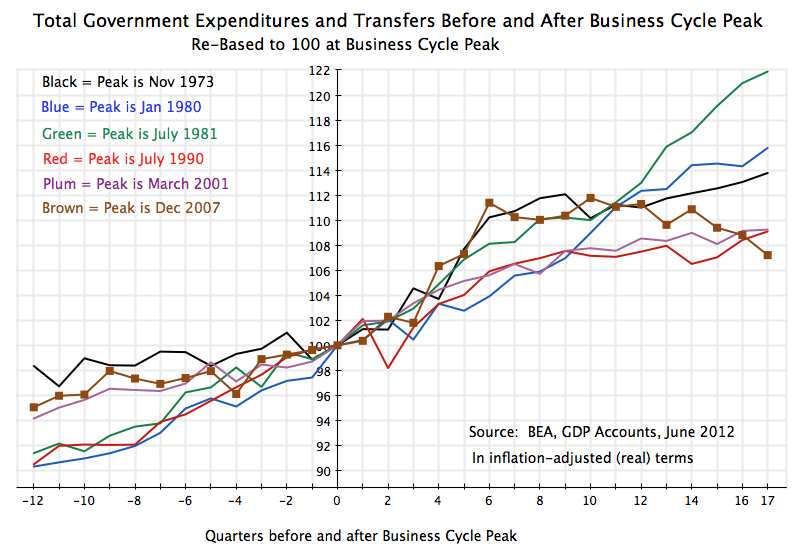 The cause of this weak recovery is not that government has grown rapidly, but rather that is hasn’t. 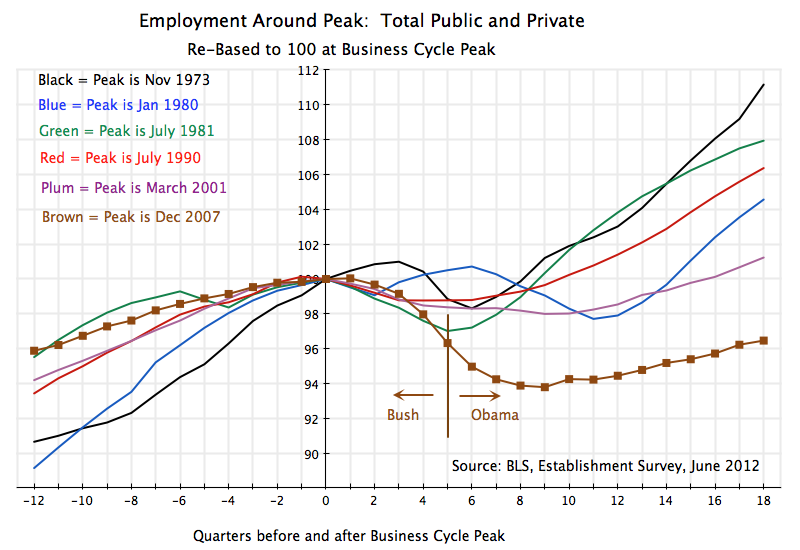 This entry was posted in Fiscal Issues, Labor, The Economic Crisis and tagged employment growth, government employment, jobs, private employment, recession by aneconomicsense. Bookmark the permalink.